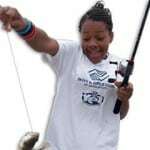 In partnership with the Department of Justice and numerous Boys & Girls Clubs across the United States, the Foundation is encouraging young anglers to pursue positive leisure activities through the Hooked on Fishing Not on Drugs® (HOFNOD) program. This program provides angling, conservation, and life skills to youth in an effort to reduce crime activities in their communities as well as contributing to the overall health and well being of the participants. The flagship educational program of the Foundation, Hooked on Fishing Not on Drugs is a long-term mentor-based program that creates ethical anglers while developing positive life skills, such as, decision-making, goal-setting, communicating meaningfully with others, and choosing to remain drug-free. Coming Soon to a school near you, “Super Fish” a new and exciting program designed for the Jr. High School PE classroom. This program is aligned with national Standards for Physical Education classroom. It provides text books, tackle and equipment and instruction for a four week curriculum with the opportunity for schools to transition interested students into a school fishing club. At this club level students can participate and advance on to state level competitions.